The iconic Eiffel Tower is located on the Champ de Mars in the 7th Arrondissement of Paris France. 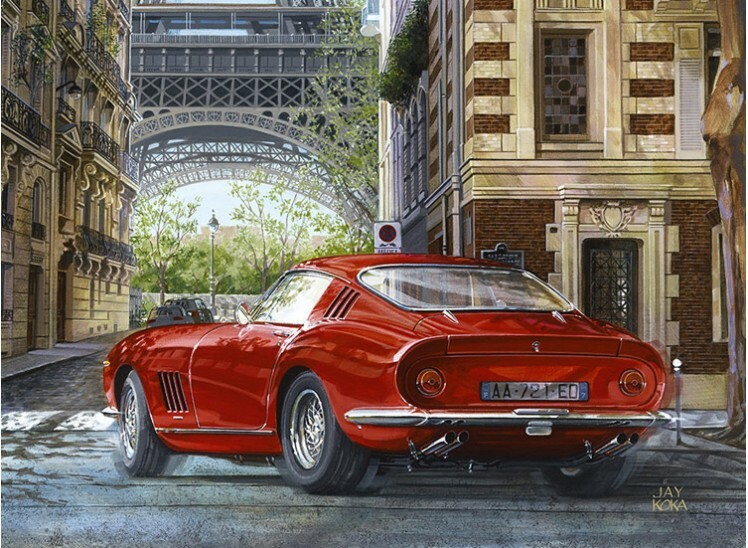 I was in Paris early in February of 2018 exhibiting my work at the RetroMobile show with the European Artist Auto group. The RetroMobile show at the Paris Expo facility in the Port de Versailles area is a long 6 indoor days so on completion, Cathy and I were thrilled to get out and have a good walk before our flight home. Fortunately the Champs de Mars is a short tram ride from our hotel and once there we were treated to a gorgeous sunny day, some excellent coffee and the prerequisite patisserie. I am forever on the prowl for painting settings no matter where I am. And this sunny morning was no different as we strolled down the Avenue de la Bourdonnais and came upon the Rue de l’Universite intersection. 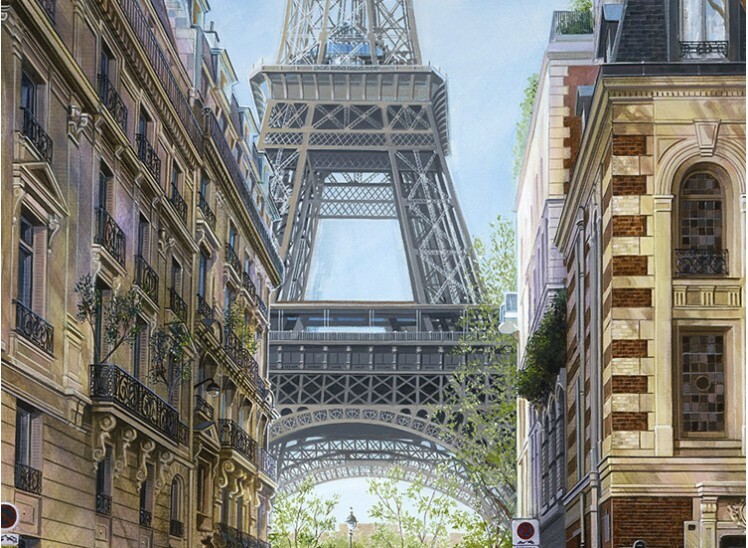 The base of the tower framed by the buildings on this gracious cul-de-sac was irresistible. 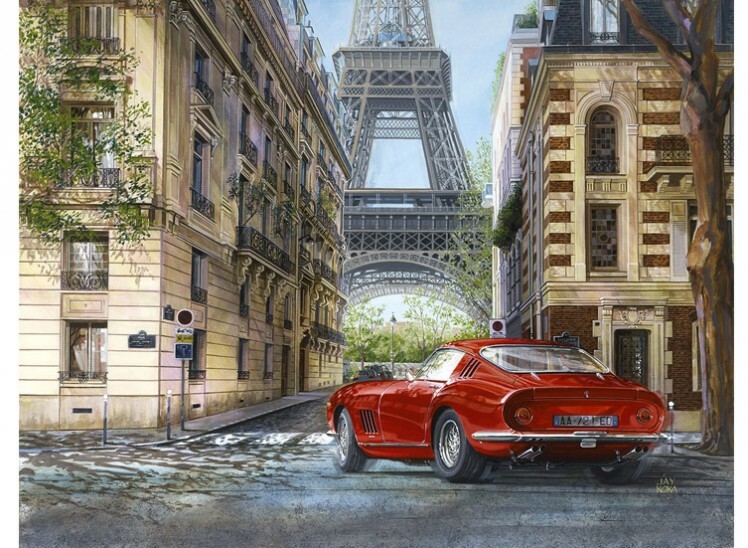 A Ferrari 275GTB/4 rounds the corner…on its way home? SHIPPING: Shipped rolled requiring stretching on arrival. Shipping for Canada and US INCLUDED. For Europe, US$45, please select SHIPPING item from "Shipping, Books&Media" Category. Shipping Shipped rolled requiring stretching on arrival. Shipping for Canada and US INCLUDED. For Europe, US$45, please select SHIPPING item from "Shipping, Books&Media" Category.